Independent researcher and demographer Dr. William P. O’Hare published a report on the changing demographics of California and their impact on the 2020 Census. The report focuses on the fastest growing groups in the state as well as the largest nine counties. Dr. O’Hare notes that persons in the aforementioned categories include hard-to-count (HTC) communities that are likely to be missed in the Census. Despite the state’s efforts and resources in place to make sure there is a complete count in California, the underfunding of the 2020 Census increases the risks of higher undercounts. An undercount in California would indicate a loss of more than $76 billion in federal dollars annually for the next 10 years. Non-Hispanic Whites and Hispanics made up 40 percent of the California population in 2016, while the second largest group is Non-Hispanic Asians. Between 2010 and 2016, the state’s population grew by almost two million people. Although there is a lot of variation amongst the groups, Non-Hispanic Whites were the only group to experience a decline in population by almost 88,000. In comparison, the Hispanic population grew by 1.4 million. In regards to the Census, these demographic groups have different net undercount rates. For example, in the 2010 Census, the Non-Hispanic White population had a net overcount. Historically, overcounted populations reflect relatively privileged groups. In contrast, Hispanic populations who have been traditionally undercounted are now the growing population in California. Another undercounted group examined by O’Hare is young children. In 2010 Census, a net of 210,000 children (age 0 to 4) went undercounted in California. More specifically, a net of 113,000 young Hispanic children in California were undercounted. Undercounting children affects funding for programs such as National School Lunch Program and State Children’s Health Insurance Program. Data shows that more than one-third of Hispanics and Blacks live in HTC communities, which are defined as neighborhoods with 20 percent or less in “Mail Return Rate”. 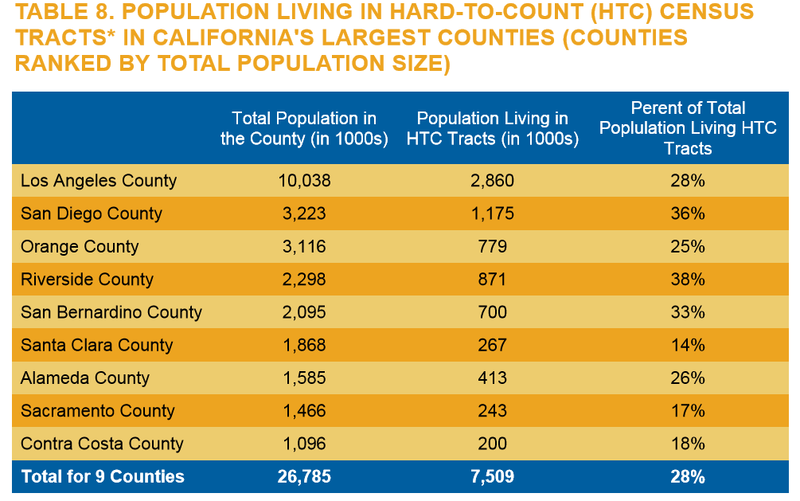 Table below shows that large percentages on California’s minorities live in HTC areas. Based on U.S. Census Bureau estimates, there are nine counties in California with more than one million people. O’Hare reports that in these counties, majority of the groups are minorities and are likely to be undercounted in 2020. Together, there are more than 7.7 million people in the nine counties living in HTC communities. The following table provides data on the number and percent of people in each of the nine counties that live in HTC neighborhoods. A lack of attention in these counties and HTC communities will jeopardize California’s federal aid but also congressional representation. For a copy of the full report, please click here. Lowenthal provided a timeline of the key milestones for both funders and The Census Bureau. For example, the Bureau has begun building address lists and funders are supporting community-based canvassers that are working with local governments. The Bureau’s “dress rehearsal” is scheduled for early 2018 and final census form questions will be finalized by April 1, 2018. In regards to funding, Choi noted that when thinking about Census funding, it is recommended to think of it as a multi-year engagement perspective. This will allow for a culture of civic engagement. Presenter Sanchez shared notes and learnings from CA funders that were heavily involved in the 2010 Census. In addition she shared a report put together by Grantmakers Concerned with Immigrants and Refugees titled “CA Counts: A funder’s guide to the 2010 Census”. Finally, Tracy shared some recommendations to help states get started on the Complete Count Committee. Tracy shared that coordination amongst funders, regional and local government offices, and community partners is significant. All of these key milestones are opportunities for our funders to support the work in their communities and ensure an accurate count. You can access the recording of the webinar here.